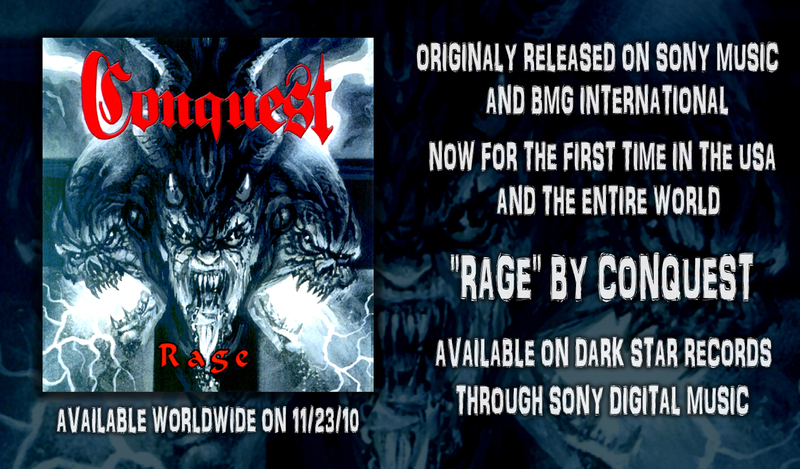 We are excited to announce that Conquest have re-released their original full length album “Rage” Worldwide via Dark Star Records. The album was originally released in Europe on November 2nd 1998. This album shows the darkest side of Conquest and is a true gem for all true metal fans. This album is now available as a special digital only re-release and can be found anywhere digital music is sold including: iTunes, Rhapsody, Amazon, Zune and More. The band “Conquest” gained strong momentum with the release of their label debut album “End Of Days”, which garnered rave reviews from metal critics across the board. The band is currently working on their next full length album entitled “Against All Odds”. The band is working once again with engineer Adam Long, and the album will be produced by Derrick Brumley. Their latest release “Against All Odds” will feature new bass player Joey Saturn and will be available worldwide in the Spring/Summer 2011 via Dark Star Records. Until then make sure and download the classic album re-release “Rage”.